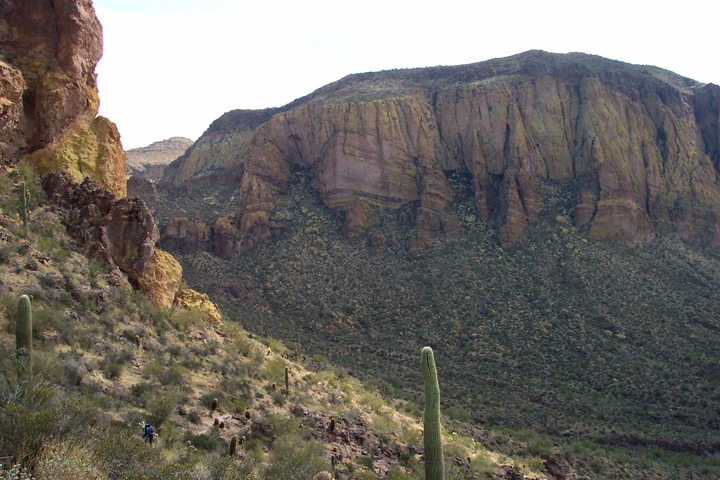 This is a through hike from the north side to the south side of the Superstition Mountains. The hike begins at the Canyon Lake Trailhead, and follows the Boulder Canyon Trail south. It then travels over the Cavalry Trail through Marsh Valley, where it meets with the Dutchman's Trail. It then follows the Dutchman's Trail to Bluff Spring Trail, and terminates at Peralta Trailhead. You will see a lot of country in this beautiful and historic area. Don't plan on there being water. Always check with the Forest Service for water conditions before you go! 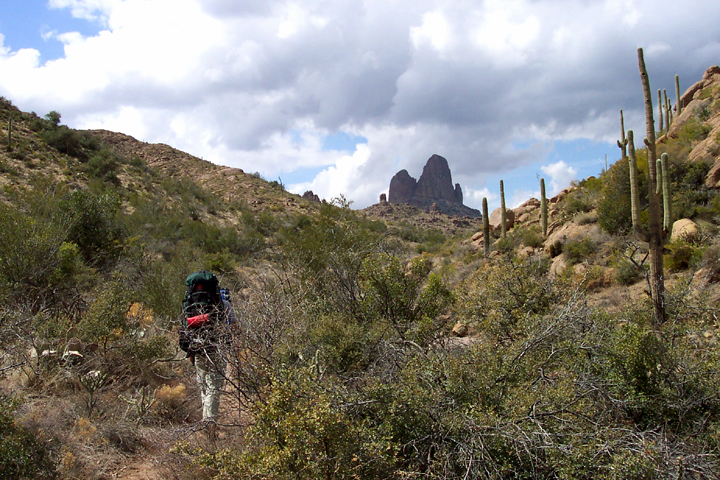 We began our three day backpacking trip at the Canyon Lake Trailhead. The Boulder Canyon Trail immediately began a 600 foot climb up a ridge overlooking La Barge Creek. Along the ridge there are some nice views of Battleship Mountain, with Weaver's Needle in the distance. The trail then gradually descends to La Barge Creek. Geronimo Head looms high above you to the east as you cross over to the west bank of La Barge Creek. Years ago, I had seen an old, rusty metal wheel barrow, probably from the Indian Paint Mine, along the creek. The trail then turns southwest, and makes a short climb up to Paint Mine Saddle. 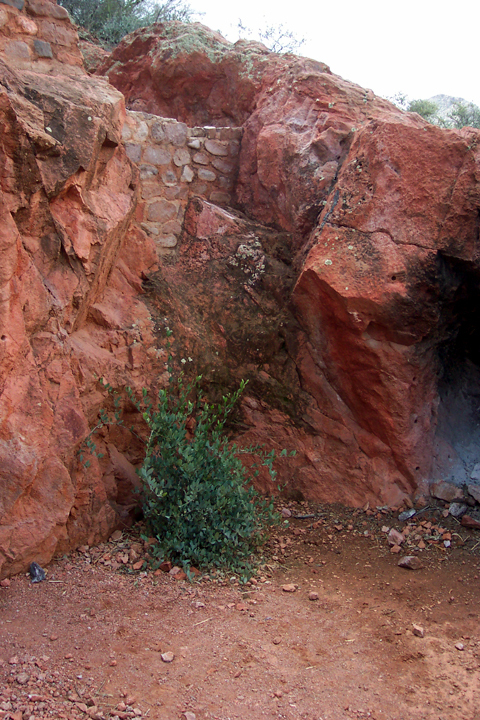 Just beyond the saddle, you will come to the Indian Paint Mine. There are some concrete foundations around the 15 foot deep mine pit. Now the trail drops into Boulder Creek. Follow the trail south along Boulder Creek as it makes endless creek crossings (look for cairns on the other side of the creek). We saw water all along Boulder Creek, as the recent snow on top of Superstition Mountain was melting. The two mile long hike through Boulder Canyon was quite easy and beautiful. At 5.2 miles we turned onto the Cavalry Trail. 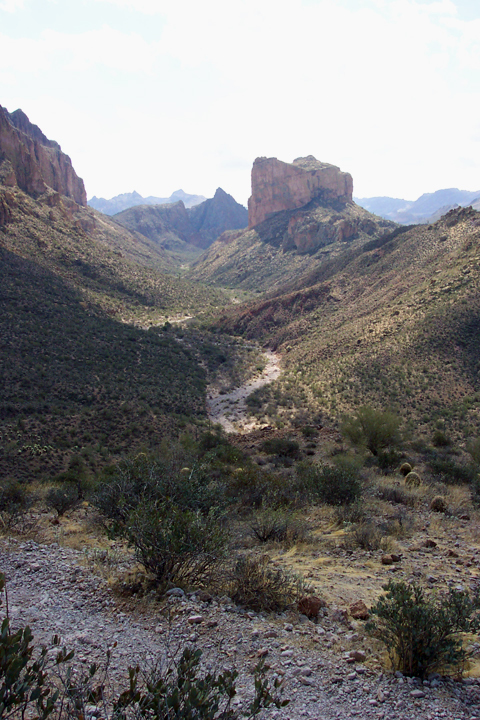 In Lost Dutchman Mine lore, there is talk of "the old military trail" or "cavalry trail" which passed through the Superstition Mountains. It was said to connect Fort McDowell to the northwest with Camp Picketpost near Superior to the southeast. Exactly where the route of this trail was may never be known. The Cavalry Trail made a short, steep climb up from Boulder Canyon to a pass on the ridge. It then made a slow descent down to the floor of La Barge Canyon, at the base of Malapais Mountain. The yellow, lichen covered cliffs of Peter's Mesa and Black Mountain tower above the trail as it winds it's way up the sandy floor of La Barge Creek. At this point, we hadn't seen any other hikers since leaving the Boulder Canyon Trail. Now began the hunt for water and a good camp spot. We intended to camp somewhere in Marsh Valley, once we found water. I have read that Marsh Valley had been named for the numerous springs in the area, but that many of these springs had dried up after the 1887 earthquake which shook the Superstition Mountains. Marsh Valley is also thought to have been the location of the main camp of the Peralta miners. 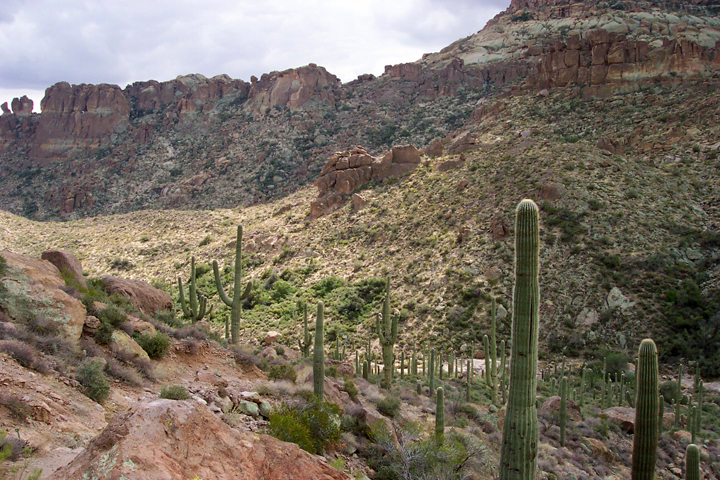 In the Hiker's Guide To The Superstition Wilderness book, it mentions that there is evidence of Salado Indian inhabitation in the Marsh Valley area. 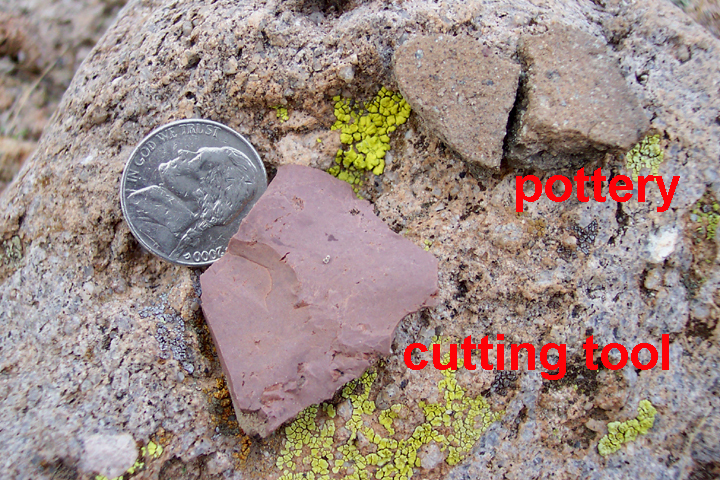 While taking a break, I saw a cutting tool and a couple small pottery shards on the ground. Cool! We soon came to the end of the Cavalry Trail, then turned east onto the Dutchman's Trail. A short ways up La Barge Canyon from here, John found a great camp spot near some giant cottonwood trees, with water nearby. We camped here for two nights. That first evening in Marsh Valley, after setting up camp, we saw a guy who looked a lot like Elisha Reavis, beard and all, with a rifle in his pack, hike past us twice. Day two consisted of relaxation and cold rain. I had planned to hike up canyon to see the Peralta Master Map (a rock covered in petroglyphs that some say is an ancient Spanish map to hidden gold mines in these mountains). However, the rain and upper 40's temperatures drove us into our tents. That night, the rain stopped and the disgusting orange "Phoenix Glow" (light pollution) settled over the canyon. I fell asleep listening to an owl hooting from a nearby tree. Day three began with clearing clouds and warm sunshine. We packed up and began hiking east up the Dutchman's Trail towards Charlebois Spring. There are some other nice camp spots along the trail between Marsh Valley and the junction with Peter's Trail. I had always thought that the Peralta Master Map was on a south facing rock along La Barge Creek, near the junction with Peter's Trail. After dropping my pack and scouring the creek in this area though, I couldn't find it. The next mile up to the junction with the Red Tanks Trail was quite beautiful. There was a lot of water in the creek, and the trail passed by many large cottonwood, sycamore, and sugar sumac trees. 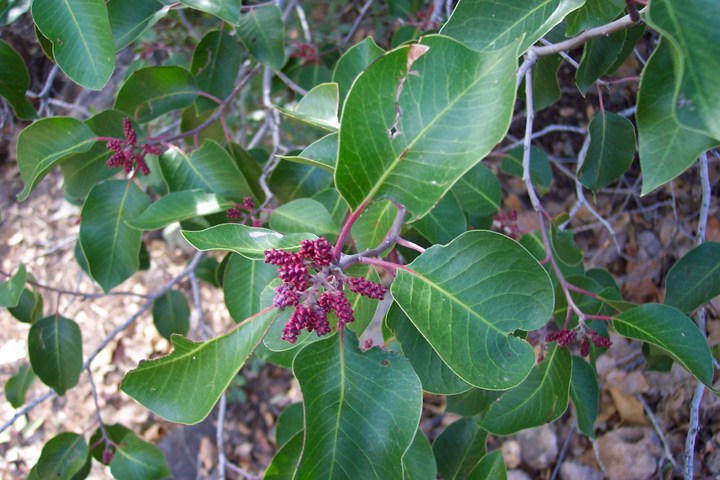 At one point, we walked through a thicket of sugar sumac, it's overhanging branches forming a sort of tunnel. We saw many broken branches from the heavy snowstorm of a week earlier. 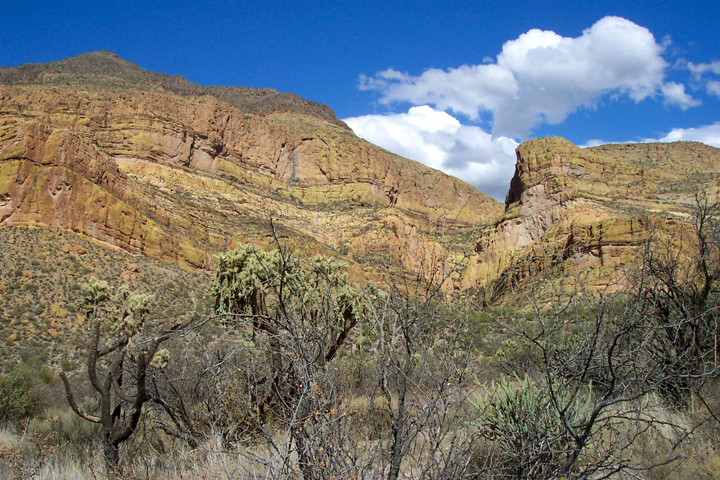 From the junction with the Red Tanks Trail, the Dutchman's Trail leaves the bed of La Barge Creek and begins climbing the eastern slopes of Bluff Spring Mountain. There is no shade between La Barge Creek and Bluff Spring! Upon reaching the southeast corner of Bluff Spring Mountain, the Dutchman's Trail meets up with the Bluff Spring Trail. Here you will find trees, shade, and possibly water. Follow the Bluff Spring Trail west up Bluff Spring Canyon. As you climb higher in the canyon, Weaver's Needle begins to pop up in the distance. As we approached the saddle, Jason, who was hiking behind me, attempted to launch a jumping cholla segment over my head with his hiking pole. The trajectory was off, and the cholla segment bounced off my side. I'm amazed it didn't stick to me! (No Superstition hike is complete without a tale of jumping cholla.) 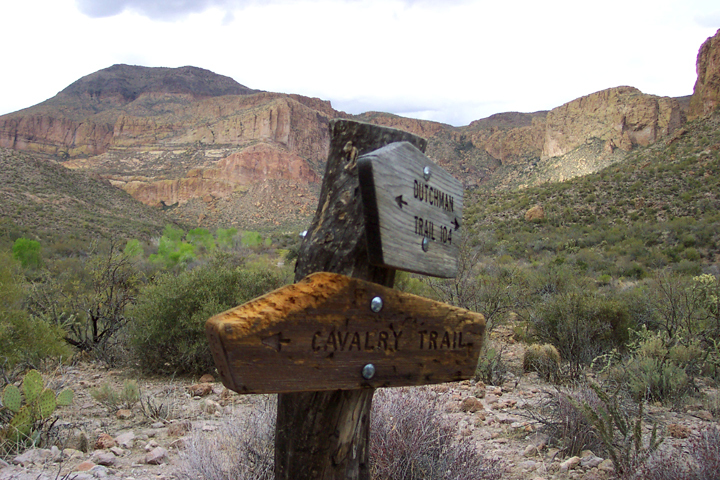 Just beyond the saddle, the trail turns south, passes the Terrapin Trail, and enters Barks Canyon (named for early rancher and Lost Dutchman Mine hunter Jim Bark). 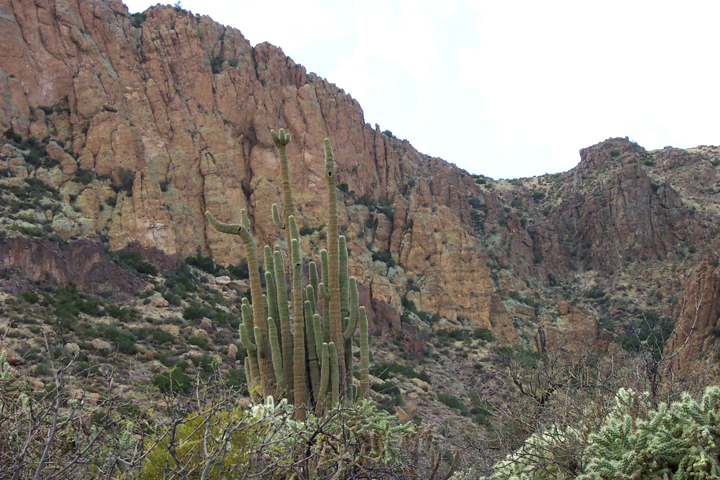 This is a very scenic area covered in saguaros, with many rock towers on the canyon walls. After a mile or so the Bluff Spring Trail begins climbing out of Barks Canyon. Once you are out of the canyon, you will be able to see the flat desert country on the south side of the Superstition Mountains. I thought I saw Mt. Lemmon, near Tucson, on the horizon. The trail now begins it's final descent to the Peralta Trailhead. Upon arriving at Peralta Trailhead, our hike was complete. I had such a great time, I wanted to turn around and head back into the mountains again. From the junction of Idaho Road & SR-88 follow SR-88 14.4 miles east to just after mile marker 210. Turn left into the Canyon Lake Marina parking lot. The area closest to the SR-88 (furthest away from the Marina) is the actual trailhead parking. The area allowed is marked in front of each space. There's restrooms outside the restaurant. The restaurant is better than you might think for being out in the middle of nowhere. Try the stuffed Jalapeños, the berry sauce is awesome. Sit on the patio and watch the HUGE fish swim below. The 'Dolly' Steamboat (a tourist attraction) is way out of character for the area, but the snowbirds eat it up.